"Has a short reach, but always finishes up a combo attack with a powerful critical blow." "Obtained in Monstro. Not very powerful, but very easy to handle." "A Keyblade that is capable of swift strikes. Its powers will automatically keep you safe." Slay 40 enemies with the Wishing Star. Slay 80 enemies with the Wishing Star. Slay 120 enemies with the Wishing Star. Slay 160 enemies with the Wishing Star. The Wishing Star is a Keychain for Sora's Keyblade which appears in Kingdom Hearts, Kingdom Hearts Chain of Memories, and Kingdom Hearts Re:coded. In Kingdom Hearts, the Wishing Star can be found in a chest at Geppetto's House after Gepetto and Pinocchio escape from Monstro. In Kingdom Hearts Chain of Memories, the Wishing Star is the signature Attack Card for Monstro. The Wishing Star's overall appearance is similar to the cogs and gears in a clock. 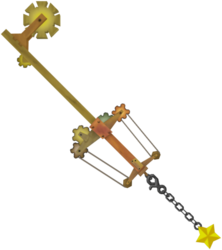 The teeth of the Keyblade is one gear attached to the main blade by a piece of wood. There is another small gear on the main blade. The handguard is comprised of four gears of various colors, and pieces of wood attached to pulleys with string connecting the pulley to the gear. The Keychain's token is the star that Geppetto wished upon in Pinocchio. Interestingly, the token also resembles Kairi's good-luck charm after being altered by Naminé in Kingdom Hearts Chain of Memories. The Wishing Star's English name, as well as its Japanese name, "Wish Star", reference the star Geppetto wished upon to bring Pinocchio to life. The names of its upgrades in Kingdom Hearts Re:coded are designed to invoke the image of a shooting star, with the trail growing with as the level increases. This page was last edited on 5 April 2019, at 15:11.